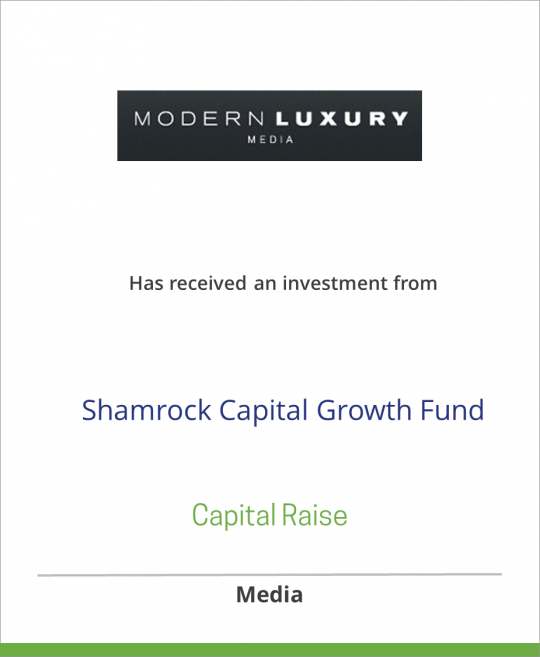 Modern Luxury Media has received an investment from Shamrock Capital Growth Fund L.P.
Modern Luxury Media, LLC is the largest publisher of regional luxury lifestyle and in-room hotel publications. Titles include CS magazine (Chicago), Angeleno magazine (Los Angeles), Riviera magazine (Newport Beach and San Diego), Modern Luxury Dallas, Front Desk Chicago and Front Desk Los Angeles. Modern Luxury provides both residential readers and upscale visitors with an educated, in-the-know look at fashion, shopping, home design, dining, celebrity interviews, society events and culture. With elegantly designed, oversized, glossy formats, Modern Luxury sits in the upper-echelon of luxury publications can be found online at www.modernluxury.com. Shamrock Capital Growth Fund, L.P., is a private equity fund based in Burbank, California, and is an affiliate of Shamrock Holdings, Inc., the private investment company of the Roy E. Disney family. Shamrock and its affiliates have been investing in private equity since its inception in 1978. Its current portfolio companies include NETGEAR, Inc. (NASDAQ: NTGR), PRN Corporation, Portal Player, Inc., Triad Broadcasting Company, L.L.C., and Lifestage Media Group, Inc.
Investment from Shamrock Capital Growth Fund, L.P.